Discussion in 'Made with GameMaker' started by CROmartin, Dec 16, 2018. 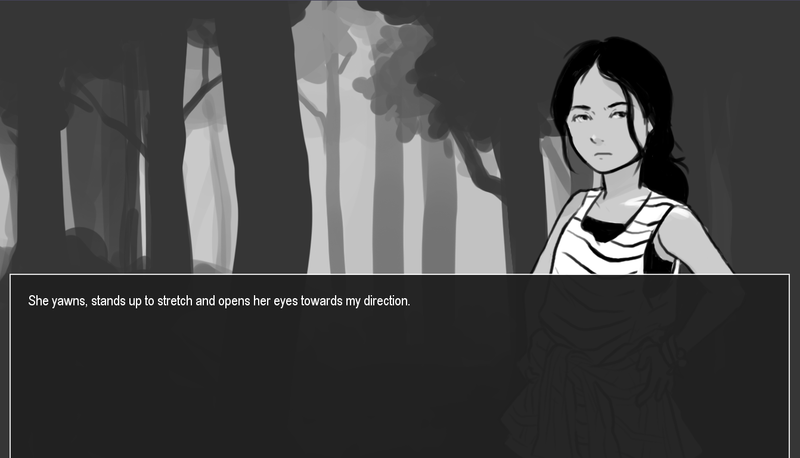 The Tress Surround Us is game made for "Light Novelber 2018" which purpose is motivate people into writing and finishing novel, as I am not to much into writing but I did wanted challenge myself with programming visual novel. So I teamed with partner(link) that wrote, draw and done other stuff for purpose of creating game while staying hardworking and motivated. Two friends stray from their camping trip and inevitably end up lost in the woods. Depending on the player’s decisions, the two can find closure in their relationship and get out, or not. We would like to hear your critique and opinion. More about game and download link on GAME PAGE. Now also playable in browser!! Thanks on noticing me, but can you tell me in which version this happens(browser or win)? Maybe some specific steps were taken before this happened? This happens in browser version (Google Chrome). I don't know why and when it's happening, i think it's just randomcity. I like the art too. Edwin and CROmartin like this.